PLEASE USE THE EMBEDDED FORM FOR ENTRIES. COMMENTS HAVE BEEN SHUT OFF DUE TO OTHERS NOT USING THE FORM. THE FORM ENTRIES WILL ALLOW ME TO FIND THE WINNER QUICKER ONCE RANDOM.ORG GENERATES THE WINNING NUMBER. Awhile ago, I posted about the hottest toys and Zhu Zhu was one of them. Surprise! Look at how popular they are! I'm so amazed and had no idea that $10 toys could turn into the latest Cabbage Patch craze. I have an "extra" one and have decided to give it away to one of my loyal readers or soon to be new loyal reader! I don't know which one it will be as I'm waiting on the three to arrive from my eBay tranaction. Just a note to those looking for one, go to eBay as I got mine for around $30 to include shipping each. When searching, pick the closest ending time and then bid!!! Leave a comment on any non-giveaway post and come back here to leave your entries. Enter any of my other giveaways (no limit) and leave your entries here. Post on any other forums and leave the link with the entries here. Giveaway ends 12/20 at midnight EST so I can ship out ASAP. Winner will have 24 hours to ensure delivery is done by Christmas. I am using forms to collect comments as it's much easier to manage and identify a winner quicker. I will take the existing comments to the post and place in the form spreadsheet but please use the form. What a great way to start building on your Christmas presents! Yes. Most definitely. Absolutely. That's a "yes" vote from me, in case I was being too vague. YES! My daughters have these at the top of their Christmas lists! I can'tfind them in stores anywhere. I would love to get one! For the life of me, I can't find these anywhere. At least at an afordable price. My son is really hoping Santa brings him one and I've been to and called almost every store in our area. Hard to believe a little hamster like this could be the hot toy of the year. These are really cute however. Thanks so much for offering this giveaway and Happy Holidays! I follow on Twitter as maxfate. I've entered your Oompa toys Baja Animal Dominoes giveaway. I'm an email subscriber. My daughter has been asking for a Zhu Zhu pet! my daughter wants one soo bad. I follow you on Twitter as Facetwit17. 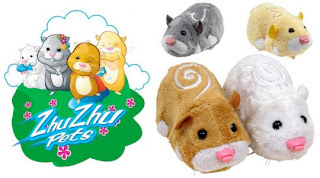 I'm a follower with 2 granddaughters that have Zhu Zhu Pets on their wishlists. I follow your blog and my daughter wants one of these. My daughter wants one SO bad!! Thanks for the chance. I entered the leap frog giveaway. I entered the green mountain coffee giveaway. I entered the head organics giveaway. I entered the dove giveaway.